When it comes to asparagus, it’s hard not to feel greedy. Their season is long-awaited and, up until recently, hard to find unless homegrown. It’s with great pleasure that I’ve watched increasing numbers of farmers make the commitment of the land and time it takes to first harvest — up to three growing seasons — to supply us with this springtime treat. 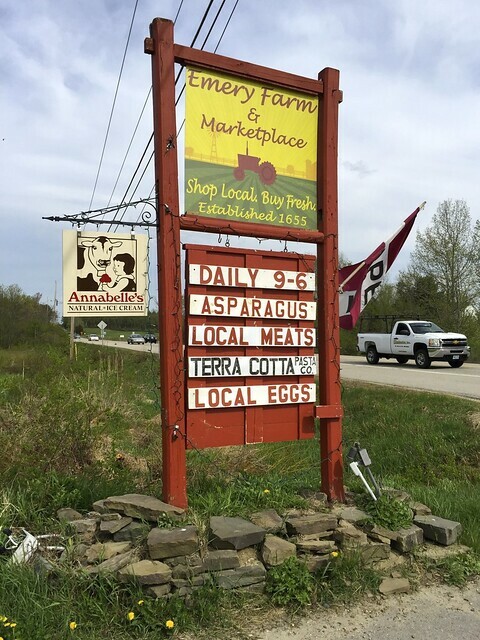 As I drove past Emery Farm on my way home this week, I spied “asparagus” featured on their roadside sign and quickly turned in. I knew that I wouldn’t be able to get to the weekly farmers market, but still had a craving for something spring-like to cook with. Situated in Durham, this is one of the many wonderful farm stands in the Seacoast that make local food available on a daily basis. The asparagus beds at Emery Farm are only in their second year, and, once the beds get established, they expect the harvest to last for up to 8 weeks. I came home with three bunches, knowing that they’ll easily keep another week left on the counter. Simply place them upright in a bowl or glass with the cut ends submerged in an inch or two of water, just as you see here. Consider them like a bunch of flowers — change the water every so often, and the stalks will continue to lengthen and grow. 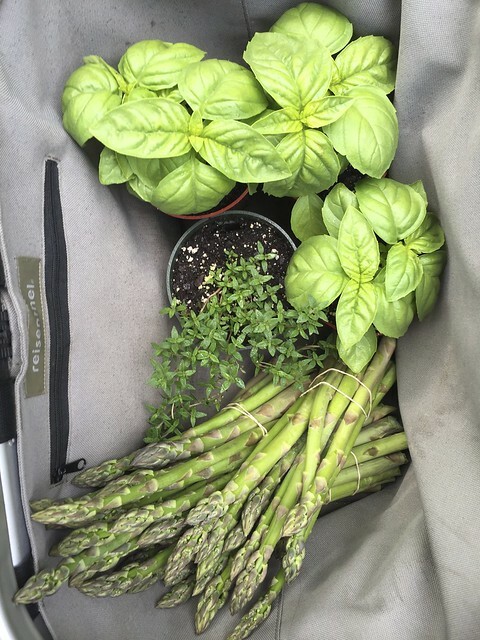 This entry was posted in local food and tagged asparagus, basil, farmstands, herbs. Bookmark the permalink. On the counter! I never knew, mine has always been in the fridge! Thank you! Funny enough, me too until now! Bought enough to have every day this week! Once the season gets started, looking forward to using their herb cutting garden! Asparagus, yum. A springtime delight. I love it that my favorite bloggers are into local and seasonal foods, as well as growing their own. 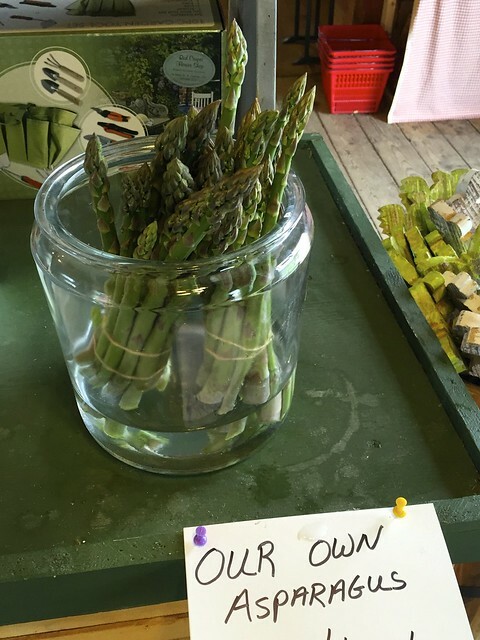 Yes asparagus is yum but Oh My – a farm that was established in 1655, still owned by the same family?! Phenomenal!